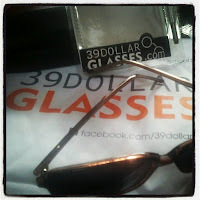 Just a few weeks ago I ordered my very own pair of Oxford sunglasses online, from www.39dollarglasses.com. The website gives a large variety of prescription and non-prescription glasses to choose from including different styles, shades, colors and more for glasses and sunglasses. Website: I love that the reviews for each pair of glasses is right on that page, which always gives the consumer some confidence, and it's certainly very convenient. Each pair of glasses shown offers a glance at the pair of specs on a certain face shape for an idea of what they may look like on you. Overall the website is easy to navigate, clearly displaying prices, and providing a fairly specific search engine to find different products. My only complaint (or rather compliment on their marketing squad) is that the majority of the glasses are not really 39 dollars. Some of them are, abut most of them in the $50-$60 range. Glasses: The pair I ordered were non-prescription sunglasses with a grey tint. When I was looking through the website, I couldn't believe how many different options there were for choosing the right pair of glasses. My purchase, like all other purchases from the site, included a hard case, a micro-fiber cleaning cloth, and a 100% guarantee and a tiny eyeglass repair kit. The glasses (and lenses) I received are very light weight, as noted on the website, so unfortunately they don't stay on top of my head. But surprisingly they do stay on my face when I play ultimate frisbee, which was a pleasant surprise.